Chennai Metro Water claims that no less than 98.6 per cent of the city is connected to the sewerage. 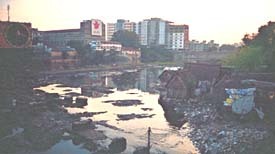 If the rainfall (and consequently the water supply) is normal in Chennai, it generates 300 million litres per day (MLD) of sewage. It has a treatment capacity of 262 MLD, but the treatment is only up to the secondary level. Of this 27 MLD is sold to industrial units in Manali, where it is further treated and processed for use. 262 MLD of sewage is treated in four major and one small treatment plant. The major plants are: Koyembedu (treats 34 MLD, Nesapakkam (23 MLD), Perungudi (45 MLD) and Kodungaiyur (160 MLD). Four waterways traverse the city. They are: Buckingham canal, Otteri Nallah, and Adayar and Cooum rivers. These are all eyesores at present. They have been reduced to conduits of sewage and industrial effluents. The flat rate of Rs 50 that Metro Water charges domestic consumers includes water supply and sewage disposal charges. "In addition, a water supply and sewerage tax is collected once in two years. It comes to about 7 per cent of the rental value of the property," says Madhavan Murthy, the utility's chief engineer. Metro Water claims only 17 per cent of the city's sewage is untreated. One visit to the waterways nails their lie. Even the Central Pollution Control Board points out the level of biological oxygen demand (and indicator of pollution) in the Cooum river is 480 milligramme per litre (mg/l) as against the maximum permissible limit of 3 mg/l. Why does Metro Water lie? Well, it doesn't know for sure the amount of water Chennai uses. How will it calculate the amount of sewage? Chennai has 4.46 million people. If it is assumed that the water consumption is 200 litres per capita daily, the amount of sewage can be estimated at 700 MLD. The amount of untreated sewage, hence, is 448 MLD, which is 63 per cent of the total sewage -- and this assumes that all the treatment plants are operating at full capacity. No wonder Chennai's waterways are repulsive to the eyes and the nose. If Chennai collects and treats its sewage and reuses it (for non-potable and industrial uses), a sizeable chunk of its demand can be met. The treatment plant at Kodungaiyur sells 27 MLD of treated sewage at the rate of Rs 8 per kilolitre -- a competitive cost. The daily demand for water is 880 MLD. The 700 MLD of sewage can help meet this. The state government has recently shown an inclination to this. Two major industrial units, Chennai Fertilisers Ltd (CFL) and Petroleum Corporation Limited (CPCL), have installed a tertiary sewage treatment plant each. These will use sewage supplied by the Kodungaiyur sewage treatment plant, which treats it up to the secondary level. The capacity of these plants is 11 MLD and 22 MLD respectively. Industry in Chennai has little, if any, dependence on Metro Water. Most industrial units rely on their own borewells or buy water from private operators. But some large units, such as Ford India Limited, Hyundai Motors Limited and Ennore Thermal Units, consume large quantities of groundwater and surface water. Partly treated sewage can provide for several industrial uses, should willingly switch to using such water. Chennai's water scarcity is an impermeable problem for industry. Most units have effluent treatment plants to reuse wastewater for gardening or cooling. Some units are more daring. CPCL and CFL have started buying partly treated sewage from Metro Water, which they further treat for use as raw water. CPCL buys 9.45 MLD of partly treated sewage from Metro Water at the rate of Rs 8 per kilolitre. CPCL uses a zero-discharge plant that not only helps convert sewage water into process water but also treats the effluent. "Earlier, we used to discharge our industrial waste into the Buckingham canal. Now, we do not add to the pollution of the city. We reuse every litre of sewage," says a CPCL official. The company is a pioneer at sewage treatment -- its efforts began in 1991. At its treatment plant, the sewage is settled in huge ponds, aerated to reduce organic pollutants and pumped through filters to remove chemicals. The water is finally pumped under high pressure through imported membranes in a reverse osmosis unit. CPCL's zero-discharge water treatment plant was inaugurated in March 2004. Its capacity is one million litres a day, and it uses membranes developed by CPCL in collaboration with the Central Salt and Marine Chemicals Laboratory in Bhavnagar, Gujarat. "We undertook the project to develop commercial size membranes matching the performance of imported membranes," says a CPCL official. The Rs 60 lakh project was funded by the Indian Oil Corporation. The zero-discharge plant recovers 75 per cent of the water from the sewage. The technologies adopted by the CPCL can be of use to other water-intensive industries as well as public water supply units for recovering potable water from brackish water, the official added.